Tavares says PSA will hold on to its place as Europe's second-largest automaker by sales "and be a profitable No. 2." BRUSSELS -- PSA/Peugeot-Citroen will defend its position as Europe's No. 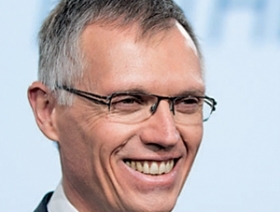 2 carmaker after Volkswagen Group, CEO Carlos Tavares said at the Automotive News Europe conference. "We want to keep a strong No. 2 position in Europe," he said. "It would be arrogant and unrealistic to [say we will] become No. 1. But we strongly believe we have enough arguments to stay No. 2, and be a profitable No. 2"
Volkswagen Group is Europe's best-selling automaker, with sales of 1.1 million vehicles in EU and EFTA markets in the first four months of this year. PSA, in comparison, sold less than half that at 496,243 cars, according to figures from the industry association ACEA. The distance between the two underlines a growing divide in the European car industry between the German heavyweights and their smaller, struggling mass-market competitors in southern Europe. Tavares has one of the toughest jobs in the auto industry right now -- bringing PSA back to profit from what he admitted on Wednesday had been a “near-bankrupt” company. The automaker has lost 6 billion euros over the past two years, forcing its founding Peugeot family to sell part of its controlling stake to the French government and to PSA's Chinese partner, Dongfeng Motor Corp.
To achieve his turnaround plan unveiled in April, Tavares has pledged to reduce the pricing gap between rivals and the group’s Peugeot, Citroen and DS brands; reduce the number of models by nearly half and leverage Asian growth through Dongfeng. His job is made more difficult by the tough business conditions in Europe, where volume carmakers are slogging through a brutal price war in a market that it just coming out of a six-year slump. A tepid recovery this year has so far shown little improvement on pricing. Tavares told the Congress he plans to shave 600 euros of production cost from each car leaving PSA's factories in Europe before the end of this year and take out an additional 500 euros in costs per car for those same models between 2015 and 2018. “That’s the good news about being almost dead, if you recover from there, the opportunities you have in front of you are, of course, bigger than other people who have done this job in previous years,” he said on Wednesday. He said PSA would continue to work with General Motors to build three vehicles that if successful could pave the way for more. “The GM partnership is not dead. The most important thing is to make it happen in a pragmatic and a win-win way,” he said. Tavares said he had a high level of confidence that his turnaround would succeed, because people working at the group recognized the need for change and the top 15 managers were on board. He said he often warns his staff not to lose focus when the first signs of turnaround start to show. PSA’s turnaround plan faces “a big question mark,” UBS analyst Philippe Houchois said at the Congress earlier on Wednesday.